Skin grafts have been performed for a long time. In the sixth century B.C. , doctors in India were successfully performing skin grafts. The practice apparently was not used outside of that area of the world again until many centuries later. In the sixteenth century, Italian surgeon Gaspare Tagliacozzi revived the old procedure. He attached a skin flap from the forearm of a patient to the nose. 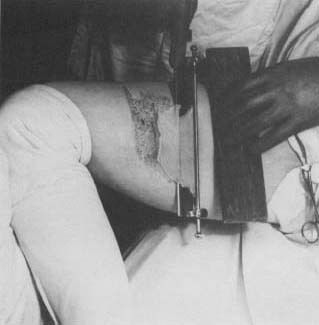 Since he used living tissue, the flap was still attached to the patient's arm when the attachment was made. After the tissue started to grow on the nose a few weeks later, Tagliacozzi severed the flap from the arm. Tagliacozzi did not attempt to perform skin grafts using skin from other people. He felt that body would naturally reject foreign body tissue. Skin is harvested for a graft. Today, medicines like Imuran have increased the likelihood of successful skin graft surgery. In fact, rejection of tissue is the greatest problem with grafts or transplants of any type. Using drugs like Imuran (or azathioprine; developed in 1962) increased the likelihood of success with grafts. In 1963 steroids were used in conjunction with Imuran during surgery. The results were even more improved. Today, the use of steroids with immunosuppressants is considered normal treatment. An immunosuppressant suppresses the body's natural immune response to an antigen.